On Tuesday, the United States Navy sent its state-of-the-art guided-missile destroyer, USS Lassen, into waters within 12 nautical miles of Subi Reef, which China claims. Chinese naval vessels shadowed the USS Lassen until it left the waters around Subi Reef and Mischief Reef. These actions have drawn attention to the risk of incidents at sea leading to growing tensions and even conflict in the South China Sea. China has built a helipad, wharves, a weather observation station and a four-storey building on Subi Reef after extensive land reclamation. China also appears to be reclaiming land for the building of a runway, as well as a parallel taxiway, capable of meeting any military requirements. General Zulkifeli Mohd Zin, as "provocative" when he spoke at the defence-focused Xiangshan Forum in Beijing on Oct 18. The US move was an attempt to assert freedom of navigation in the contested South China Sea, an important waterway that carries almost 30 per cent of global trade, including nearly 60 per cent of Japan's and Taiwan's energy supplies, and 80 per cent of China's crude oil imports. The US Navy has reiterated that it will continue with such patrols in the South China Sea. On Wednesday, the Chinese Foreign Ministry summoned the US Ambassador to China Max Baucus to protest against the US action. Executive Vice-Minister Zhang Yesui told Mr Baucus that the US had acted in defiance of repeated Chinese objections and had threatened China's sovereignty and security. Chinese public opinion has also been critical of the US action, highlighting the risk that growing nationalist sentiments, especially among younger Chinese, could reduce the Chinese government's freedom of action in future. For South-east Asia's littoral states, the American and Chinese positions draw attention to the increased risks of conflict in the South China Sea. There is also the possibility that regional claimant states could miscalculate and take stronger action to pursue their claims in the belief that they would have the support of the US. The firmest support for the US came from Philippine President Benigno Aquino, who saw "no issue" with the US exercising freedom of navigation. Although other regional claimant states probably welcomed the American initiative, they avoided statements indicating that they supported it. Among American allies, Australia's Defence Minister, Ms Marise Payne, strongly endorsed the right of freedom of navigation and overflight in the South China Sea. Japan's Chief Cabinet Secretary, Mr Yoshihide Suga, declined to comment directly on the patrol but highlighted Japan's general commitment to "the aim of preserving free and peaceful waters" and opposition to land reclamation, militarisation, and other unilateral attempts to change the status quo. More worrying for the US is the wariness of its ally South Korea, which did not address the issue but only made a general statement supporting freedom of navigation and stressed the importance of the 2002 Asean-China Declaration on the Conduct of Parties in the South China Sea. China has never defined whether it claims all the waters within its "nine dash lines" map or only the features within it. South-east Asian states would question whether artificial "islands", such as Subi Reef, are entitled to territorial waters of 12 nautical miles around the land features from the low water elevation, based on the definitions in the Convention on the Law of the Sea. Both China and South-east Asian states have ratified the convention. But the US, which has not acceded to it, will rely on its interpretation of customary international law. China's strategy of creeping de facto control over the South China Sea has resulted in growing resistance by the Philippines and Vietnam among claimant states. They have moved closer to the US, which is seen as the only power capable of balancing China. It has encouraged rising defence expenditures, especially for the navy and air force, a trend also seen in other regional states such as Indonesia. However, as major powers, the US and China will focus on the management of their differences. Already, on Thursday, the US Chief of Naval Operations, Admiral John Richardson, had a video conference with the Chief of the Chinese Navy, Admiral Wu Shengli. Although Adm Wu told Adm Richardson that there is a risk of "a minor incident that sparks war", significantly, both sides agreed to maintain the dialogue and to follow agreed protocols to prevent clashes. Scheduled port visits by US and Chinese ships and planned visits to China by senior US Navy officers remain on track. Regional claimant states hoping for a strong American response should bear in mind that it will be difficult to convince a weary American public to embark on another major overseas conflict. This factor, together with China's interest in avoiding war so that its leadership can continue to focus on economic development, make it unlikely that China and the US will miscalculate and head blindly into war. My assessment is contrary to the view of those scholars and policymakers who believe in the considerable risk of war as China, the rising power, challenges the dominance of the US, the global superpower. An increasingly confident China has promoted economic policies designed to strengthen South-east Asian linkages with itself, popularising the slogan "One Belt, One Road" to establish a Maritime Silk Road linking East Asia to the Middle East. On the other hand, China's security strategies run the risk of alienating regional opinion and have made it easier for competitors such as the US and Japan to reinforce their ties with states in the region. The exceptions are states bordering China, such as Cambodia, Laos and Thailand, which regard the conflicting claims in the South China Sea as a distraction for Asean and have been happy to receive Chinese aid and investments. While Myanmar has shared the perspective of other mainland South-east Asian states on South China Sea issues and sought to maintain excellent ties with China during the years of diplomatic isolation, it has recently been critical of China for interfering in attempts to reach an umbrella peace agreement with separatist groups on Myanmar's border with China. A senior Myanmar negotiator claimed that China had persuaded the Kachin Independence Organisation and the United Wa State Liberation Army not to sign the peace agreement. South-east Asian states should anticipate that they will have to deal with a more assertive China in the years ahead. One harbinger of this trend was a warning by the Chinese Ambassador to Malaysia, Mr Huang Huikang, during a visit to Kuala Lumpur's Chinatown last month, that "the Chinese government opposes terrorism and any form of discrimination against races and any form of extremism". China has historically focused westwards towards Central Asia, the source of land-based threats to Chinese regimes. However, today the primary risk westwards lies in support for Uighur separatism by their co-religionists speaking similar Turkic dialects, and demands for the independence of Tibet. These two threats are primarily domestic and containable, even though there is a worry that groups such as the Islamic State in Iraq and Syria (ISIS) may incorporate Uighur nationalism within their radical framework for global extremism. 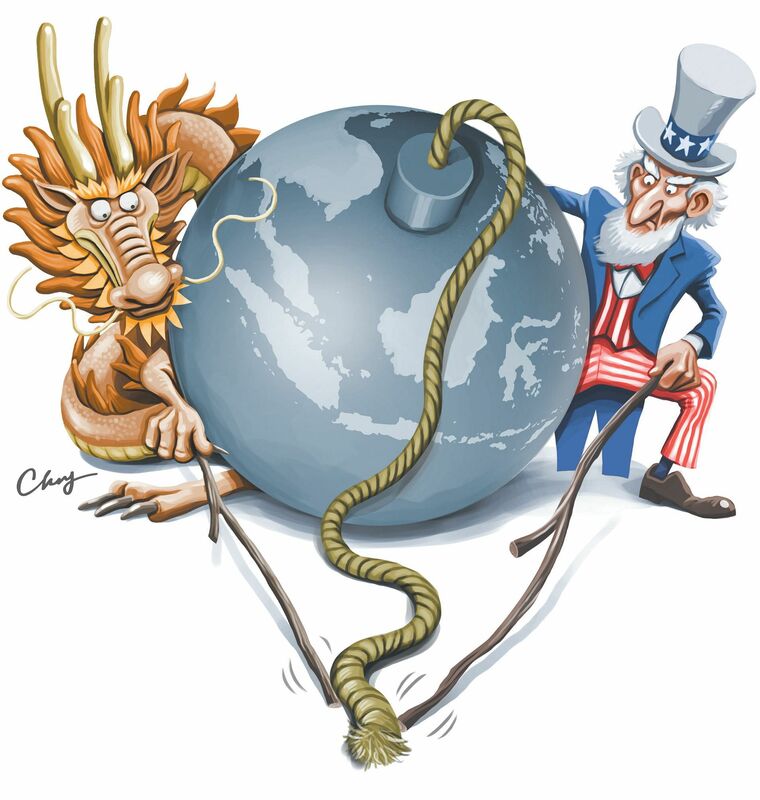 On the other hand, as Chinese power rises, Chinese policymakers recognise that the only power with the capacity to threaten Chinese interests is the US, the sole superpower, and its web of alliance relationships. This has resulted in a Chinese rebalancing with a tilt eastwards towards the Pacific. In the decade ahead, there will be a strengthening of Chinese air and sea defence capabilities and a growing emphasis on building closer economic and political ties with the littoral states on the Maritime Silk Road. However, as the US will remain a Pacific power, the effective management of the US-China relationship will be the critical issue for maintaining global peace and security. •The writer is Distinguished Fellow and Bakrie Professor of South-east Asia Policy, S. Rajaratnam School of International Studies, Nanyang Technological University.